Bob Marley died at just 36 of cancer on May 11. Two days later, while preparing to give an address, Pope John Paul II was shot four times in Vatican City. Believe it or not, MTV’s launch was still three months away, before we all became couch potatoes waiting for our favorite video to appear. 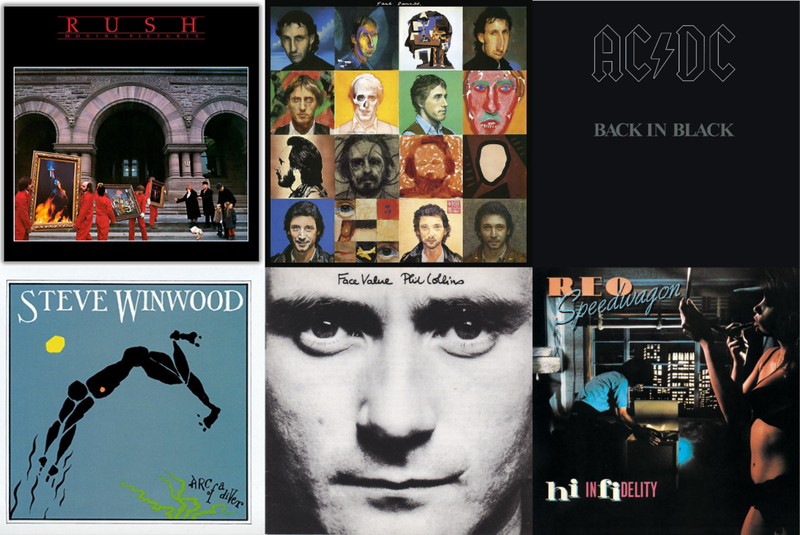 The top selling albums, as reported by industry trade magazine Record World, included releases from plenty of classic rock titans. Climbing slowly up the charts was the debut solo album from Ozzy Osbourne, Blizzard of Ozz. (The album had been released six months earlier in the U.K.) The collaboration with guitarist Randy Rhoads yielded “Crazy Train,” one of Ozzy’s signature songs. This week, Blizzard was at #69 (up from #76) and although it peaked at only #21, the album was a huge, sustained success with cumulative U.S. sales of more than four million. Daryl Hall & John Oates‘ Voices moved up from #49 to #44. While the jump isn’t that remarkable, the real headline here is that the duo had just released their fourth single from the album. Voices had already been on the chart for half a year and the pair were enjoying a huge resurgence with the LP’s hits: “How Does it Feel to Be Back” (#30), “You’ve Lost That Lovin’ Feelin'” (#12), “Kiss on My List” (#1) and “You Make My Dreams” (#5). In December 1979, four concerts were held at London’s Hammersmith Odeon to benefit the victims of war-torn Cambodia. The lineup featured a Who’s Who of classic rock legends including The Who, Paul McCartney & Wings, Queen, Pretenders and Elvis Costello & the Attractions. It took a while, but a two-record set was finally released in March 1981. Concerts For the People of Kampuchea was at #31 this week. Genesis’ commercial breakthrough in the U.S. is largely in part to the phenomenal success of Phil Collins‘ solo debut. Face Value, released Feb. 13, was aided by two big singles, “In the Air Tonight” and “I Missed Again.” Although both stalled at #19 on the U.S. pop chart, they were huge hits at rock radio. Though Face Value – at #27 this week – ultimately peaked at just #7, it went on to sell more than five million copies in the U.S. If you knew that Loverboy‘s 1980 self-titled debut sold over two million copies in the U.S., raise your hand! The album, led by the lively single, “Turn Me Loose,” was at #22 this week. AC/DC‘s Back in Black was at #18 in its 36th week on the chart. Although it would never rise above #4 on the U.S. chart, the album sold and sold and sold some more, ultimately becoming the second biggest-seller in history (behind Michael Jackson’s Thriller). In retrospect it’s a little confusing, but AC/DC’s third album, Dirty Deeds Done Dirt Cheap, originally released in Australia and Europe in 1976, was finally issued in the U.S. in March 1981 on the heels of the success of 1979’s Highway to Hell and 1980’s Back in Black. Dirty Deeds… the #6 top seller this week, featured vocals by Bon Scott, who died in 1980. Building upon the success of 1979’s Cornerstone, Styx released Paradise Theatre in 1981. And with two huge radio hits – “The Best of Times” and “Too Much Time on My Hands” – the album (at #2 this week) became the band’s first (and only) #1 seller. At at #1 this week? REO Speedwagon‘s gargantuan Hi Infidelity. The album had been released in November 1980 and its first single, “Keep on Loving You,” became the group’s first #1 pop hit. The album was chock full of singles with “Take It on the Run” the biggest follow-up. Decades later, on August 17, 2017, Hi Infidelity received the Recording Industry Association of America’s Diamond Award, representing sales in excess of 10 million copies in the U.S.